Home to a history which remains even today one of the most magnetic forces in the tourism in Rajasthan, the city of Deogarh or Devgarh as it is also known is one of the lesser known tourist destinations in Rajasthan. 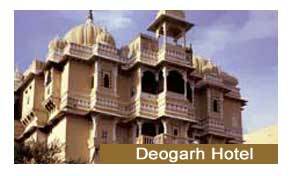 A definite must visit if you are planning a tour to Rajasthan; a holiday in Deogarh is made even more special by the presence of a number of cozy and comfortable hotels in Deogarh. By Air :- The nearest airports to the city are at Udaipur and at Jodhpur. By Rail :- Deogarh is well connected to the other cities of the region like Kota, Neemach (MP), Chittaurgarh, and Delhi by rail. By Road :- Smooth roads which are maintained well connect Deogarh to a number of the other important cities of Rajasthan and its neighboring provinces. Indiahotelandresort.com offers online room booking at various hotels in Deogarh and other cities of Rajasthan.